Sangre De Cristo Arts Center sculpture. Sangre De Cristo Arts Center sumie wall art. I am guilty of consuming garden plants like a sweet tooth consumes candy. The following is an account/ list of all the plants I purchased in 2016, primarily for my front ornamental garden only. The garden image of my front Japanese/ Chinese gardens can be viewed here at Kotojazz 83: the lazy man’s way to making area gardens. I also purchased a few herbs for the back yard, ranging from chamomile to parsley, fennel, mints and sage. Another stroke of luck. In January – March 2017 two of my original Kotojazz tunes are recognized as “Representing the West” at the Sangre de Cristo Arts and Conference Center annual exhibit. These are pure new age Americana folk songs. “Snow Blossoms” was inspired by the blue violets peeking through melting snow on a sunny winter day along Boulder Creek trail in Boulder, Colorado. “Windy Kansas Wheat Fields” was inspired by strong wind blowing over fields of grass and wheat creating a steady undulating flow like ocean waves. You can see the wind blowing through wheat fields in eastern Colorado and Kansas. Both feed our souls, in their simplicity and stillness (snow blossoms) and their awesome enduring power (windy Kansas wheat fields). A dry creek is often preferred over a creek with flowing water. It provides the visual effect of flowing water, and doesn’t require the maintenance of a flowing stream. In this case, using black creek rocks offer a striking color contrast to the green ground covers. The sound of flowing water can be experienced by adding a simple recycling water feature, such as the mini waterfall toward the back of this mini garden. This landscaper uses a few types of flowering ground covers along the black dry creek in the foreground accented with Japanese maples in the background. There are three types of Japanese maples featured here. Two Japanese purple lace maples in the foreground and far rear and the canopy created by the taller green moonlight maple in the center. Variegated hostas, an azalea, tulips, a calla lily, and mock bamboos offer nice fill ins for variety and balance. A work- in- progress of my Japanese garden in the front yard, including a dry creek rock garden, featured stones, lantern, bamboo borders, Japanese lace maple, yellow, black and red grass, various ground covers and mosses, irises and crocosmias, elderberry, succulents, a smoke tree, salvia, asters, rhodedendrums, 3 types of helleborus, 4 types of heucheras, painted ferns, razer and licorice ferns, and the featured weeping “dragon” blue spruce pine. 60-80% of a garden’s beauty can be made from resources already available around your home or among friends. Remember, nature offers its own beauty that may only need minor enhancements. I personally don’t care for regularly maintaining a yard, especially constantly mowing lawns. It just brings out the sneezing in me. Lawn mowing is among the world’s biggest wastes of water and consumes unnecessary time in my lazy, stubborn opinion. Frankly, it offers no creativity or inspiration of natural beauty. We start with creating a garden image in your head. Imagine an idyllic beautiful scene in your head. Then, dig a space of dirt, any shape you want it to be. Apply that idyllic scene to this bare space. First, simply turn over the grass and put it upside down, occasionally scraping off the loose dirt to further expose the grass roots, so the grass is certain to die. Then, take cedar droppings from underneath cedar trees in the back yard and spread it throughout the dug out space. Cedar is highly acidic and will largely reduce if not eliminate the need for weeding the area garden space. Not much of anything can grow under cedars; maybe a few rhodies (rhododendrons) which thrive in acidic soil. In the case of the above pictured garden, I dug out the entire side of the front yard off of the concrete path. I left a few “accents” of grass to provide lining for the area garden’s borders. These can be easily held at bay with an occasional weed whacking. If you want you can raise the garden, which I did for the area garden beyond the concrete path toward the top of the above photo. You can raise it as much as you like by simply adding more soil to the area and more mulch. I moved the rhody from another part of this house where it was hidden away, and is now featured in the raised garden. A general rule when creating your own garden is to place the larger items – bushes, trees, or stones – toward the back, while shorter smaller flowers and plants should be placed toward the front. As a taller, larger bush, the rhody serves as an attractive back drop to this area garden. Here is a dry creek pond around the tree, beginning a dry creek meandering along round stone steps which continue along the side of the house to the back yard. We have a fucia in full bloom and a japanese maple in blue pots in the foreground, a reddening sumac to the left, three hydrangeas (white, pink and blue), a Japanese anenome next to the sumac, a light evergreen bush next to the featured stone creating the affect of an island, a white drooping Japanese pine to the right along the mound, sword fern, and five different types and colors of heucheras. It’s always nice to have borders for the area garden so as to define its space. Borders can be stone, bricks, slate, wood, bamboo pieces, even plants. In this case, I used stones found in the ground when digging out the garden area. As for the larger boulders highlighted around the rock creek, I was fortunate to find a friend who was excavating a part of his property and was trying to get rid of these beautiful blue-hued boulders (with more to come in later phases). 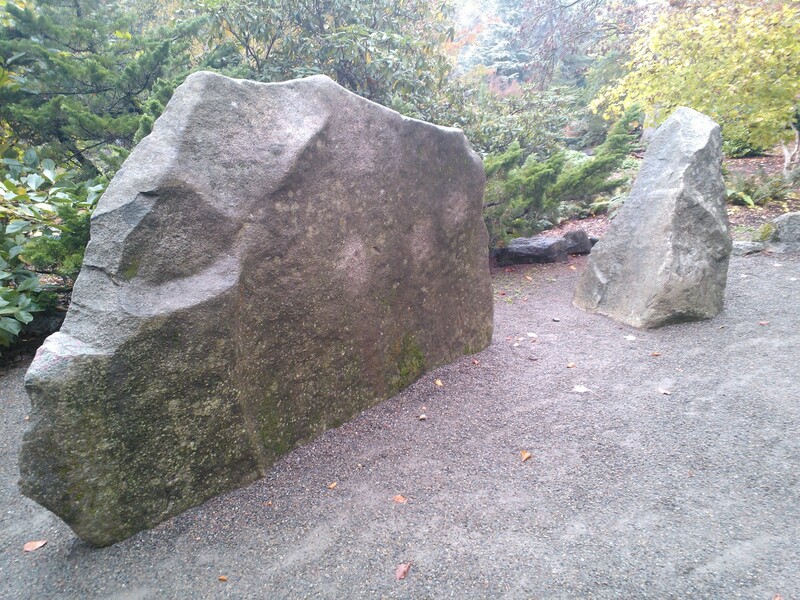 These boulders give the impression of a mountainous terrain with a valley carved out by a rolling creek. Reinforcing this mini- mountain scene is the meandering creek. I place various types of sheet moss, tree moss, and fern moss on the north, more shaded side of the garden area. Eventually, all dirt areas you see in the garden will display a plant, fern, moss, or ground cover of some type to add personality. The dry creek appears to naturally flow between the larger boulders. Each boulder enforces a bend in the creek, as it does in natural creeks. Large creek rocks are generally placed toward the outer borders of the creek, while smaller rocks are toward the center, again mimicking these natural occurrences in nature. The creek narrows and appears to flow into a small lake in the foreground toward the street. I recommend using black creek rocks if available; otherwise, the varied colored rocks will do. To make the dry creek, I dug out the space and put in a thin layer of cedar mulch, then a thick layer of sand to prevent weeds from growing in the creek rock. Soon to come will be a natural stone recycling water feature at the beginning of the dry creek. As for the flowering plants and things in this area garden, I looked for anything that might complement the “bones” of these area mounds. Fortunately in the Pacific Northwest, there are lots of plant life growing everywhere, some considered weeds in some circles. For example, ferns, wild white flowering heuchera, crocosmia, and wild blue bells grow like weeds in this region, but one can never get enough of their natural beauty. I placed the wild heuchera on the north side and underneath the rhody where it thrives in shady areas. I scatter the wild crocosmias, blue hyacinths, and blue bells unevenly throughout the area gardens to reinforce the natural look. The blue bells and hyacinths will flower in the spring while the crocosmias flower in late summer into autumn. I also have a relative of the ‘lamb’s ear’ ground cover which grows wild here and flowers a gorgeous deep magenta flower at the ends of each antler-like stem. I also have another ground cover that emerges a bouquet of hundreds of tiny white bulbous flowers during the summer and autumn seasons. I plan to add various types of ornamental grasses in addition to the Japanese red grass and the yellow bamboo grass clumps around the garden areas. I have shoots of Japanese red grass planted to the side of the weeping blue cedar, tulips and other bulbous flowers not yet blooming scattered around the area gardens as well. I was gifted a rosemary to add a year round pungent aroma and a gorgeous orange rose bush. A work- in- progress of my Japanese garden in the front yard, the garden includes two dry creek rock gardens (one in the foreground of the featured image and the other in the background as a minimalist Zen garden), featured stones, lantern, bamboo borders, a Japanese lace maple, a coral bark maple, yellow, black and red grass, various ground covers and mosses, irises and crocosmias, an elderberry, succulents, a smoke tree, salvia, purple asters, rhododendrons, anenome flowers, echinacea, 3 types of hellebores, 4 types of heucheras, painted ferns, shark tale, razor and licorice ferns, and the featured weeping “dragon” blue spruce pine in the foreground. The low budget provided for a few highlighted features, such as the Japanese lantern, Japanese coral bark maple, the weeping blue “dragon” cedar, Chinese purple lantern flowers, two red dogwood bushes, and a few ground covers such as English daisies, heucheras, and grasses. Outside of sweat equity, the total budget was a remarkable mere $141! For the future, I plan to add another raised garden across the walkway in the front, mock bamboo, a Japanese purple lace maple, ornamental grasses, and maybe a rare plant such as an aromatic variegated pink daphne, a cone flowering hydrangea, Asian tiger lilies, or a few exotic pink or magenta Japanese anemone flowers. The blue pots can feature beautiful maples such as local vine maples, or anything that requires a controlled environment such as bamboo. Japanese style rock creek garden in the making. The “Before” photo – What the garden looked like before moving into the house. 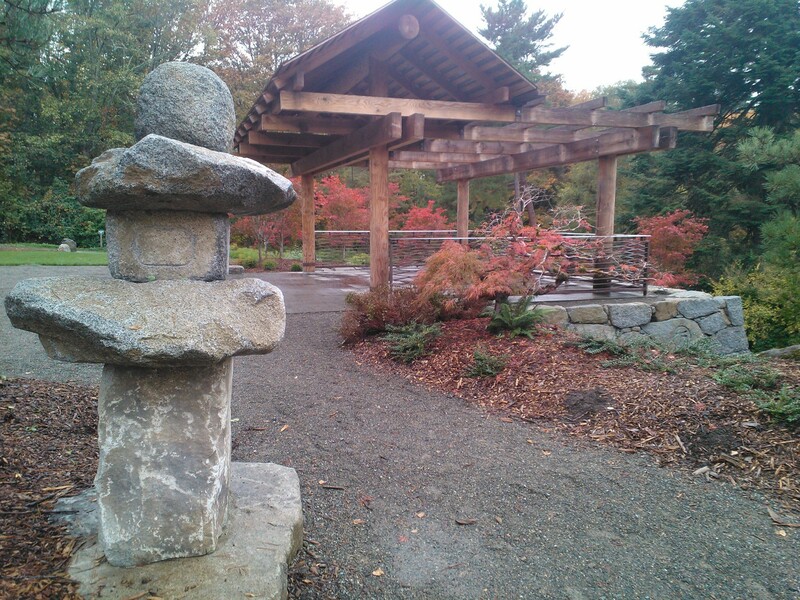 What makes a Japanese garden ? 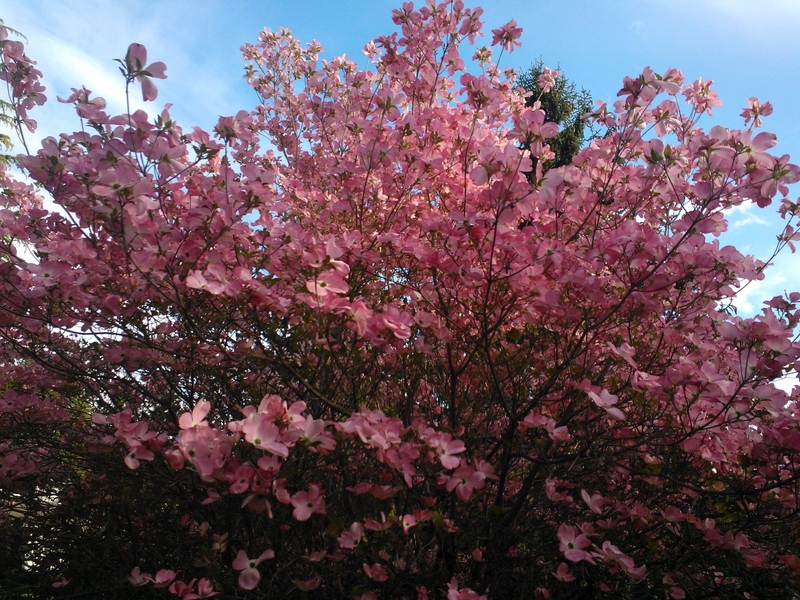 Here is a mini garden I started below a pink flowering dogwood that blooms fabulously in the spring (see picture below). In the tradition of Japanese gardens, the intent is to create patterns of paradise scenes often seen in the natural world. I spent a total of $7-8. Much of the splendor of this garden will not be fully seen until next year or the following year when the plants have fully grounded into their new homes [also, the strawberries on the right (photo above) will need to be replaced by moss or ground cover]. 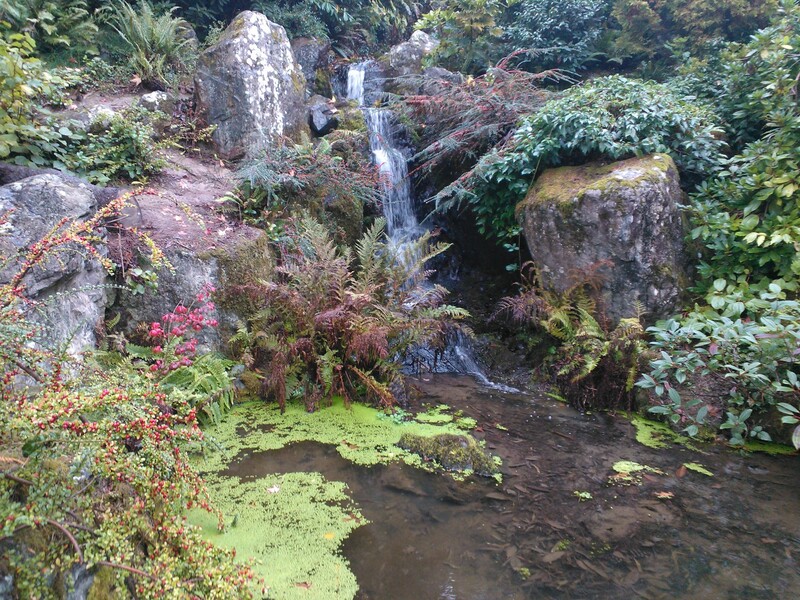 This mini garden features a simple rock creek flowing down from the a tall stone representing a mountain. The “mountain” stone is surrounded by large rocks or rounded mountains/ front range hills leading up to the cathedral- like mountain. Flowing from the “mountain” stones is the dry creek rock bed, with the visual effect of a true flowing mountain stream of water. Note that at each turn there are larger stones which is common in creeks. These help re-direct or guide the creek in another direction, reinforcing the natural occurrences seen in nature. The dry creek spreads wide at its base, suggesting it has reached more level ground, or perhaps a lake. The white lantern is placed on the side of the hill surrounding by sheet moss I found in shaded areas of the yard. In the spring, I plan to add a stunning gorgeous version of moss toward the background area called the hair cap moss. There are two transplanted ferns, one in front of the lantern, and one behind the stone mountain. Though hardly noticeable today, these ferns will show a full display of leaves next spring into summer. The fern in the foreground is a common tassel fern which will experience minimal growth in size, while the sword fern I planted behind the mountain stone will grow to a size potentially twice the height and size of the mountain stone. 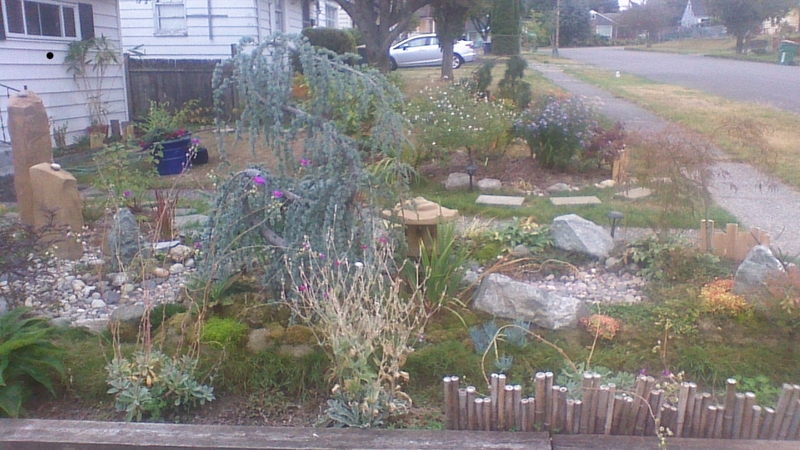 Other plants include a few strawberry plants in the foreground (not recommended; these were pre-existing plants placed there by the owner) and a spider flower to the left which flowers a resplendent deep purple in the late spring to early summer, and is now passed its prime and going dormant for the fall season. Also to the left showing simple iris-like leaves is the common orange crocosmia, which grows naturally throughout the Pacific Northwest. Finally, for effect, I planted the Acorus cascading yellow grass. The acorus next year will be a bright yellow cascade that will contrast nicely with this shaded area. There are two in the foreground. 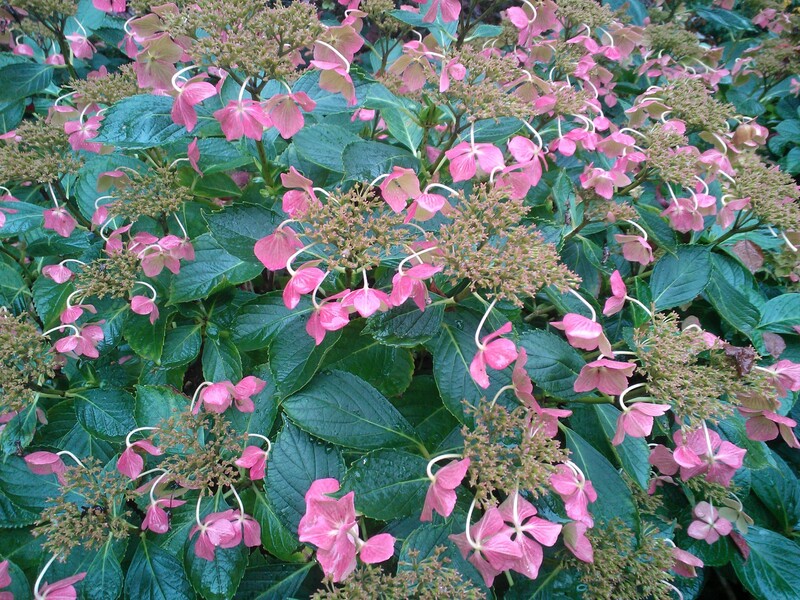 These are off shoots, so will not show their true cascading splendor until next summer. Spring into Summer has sprung and it’s time to visit your favorite outdoor places! The Kubota family created a stunning beautiful Japanese garden with mountainous waterfall landscapes, serene koi ponds, and a Zen garden in South Seattle. 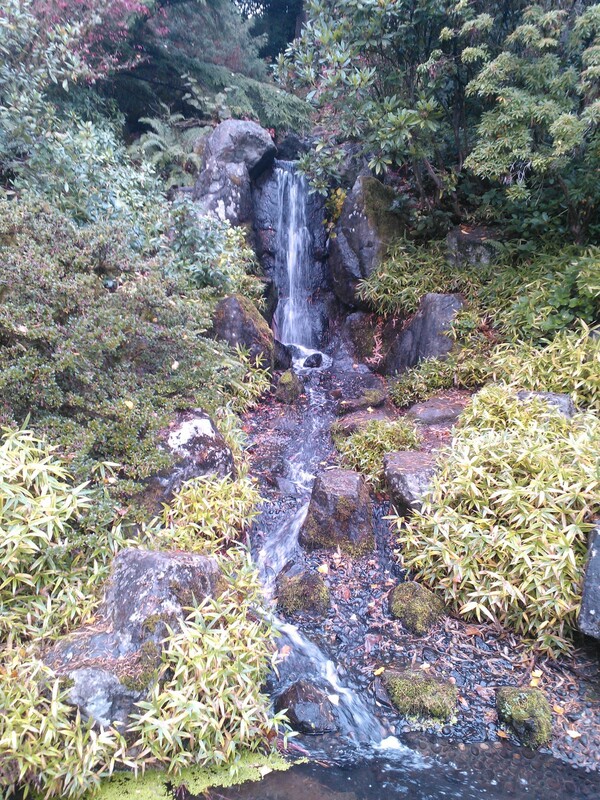 It is a gardens where many of my musical pieces were first inspired (Kubota Birds Water Dance and Raindrops Fall from Trees, for example). To me, the legacy leaves us much more. 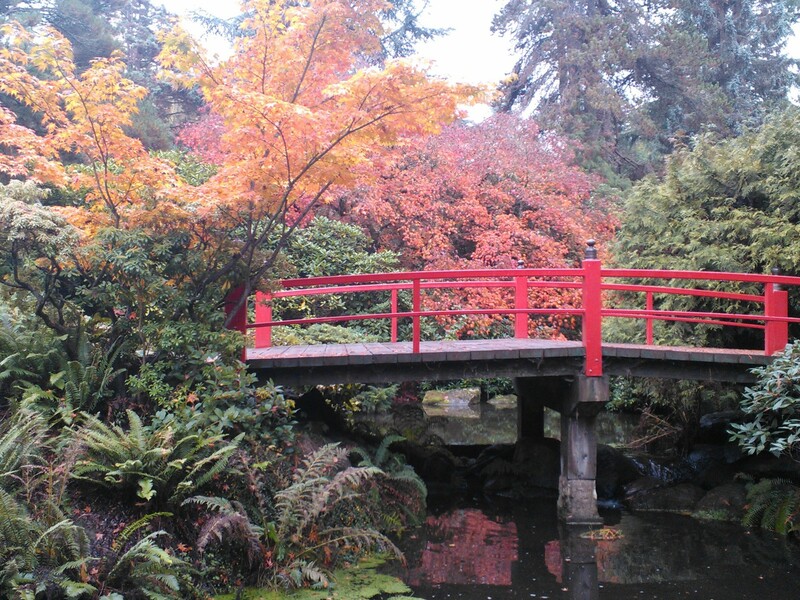 Fujitaro and family, including Tak and Tom, were interned at the Minidoka camp in Idaho during World War II, and came home to Seattle to say “I forgive” by presenting the City of Seattle with one of the premiere Japanese gardens in the Northwest. It is the former home of the Kubota family and their landscape business. 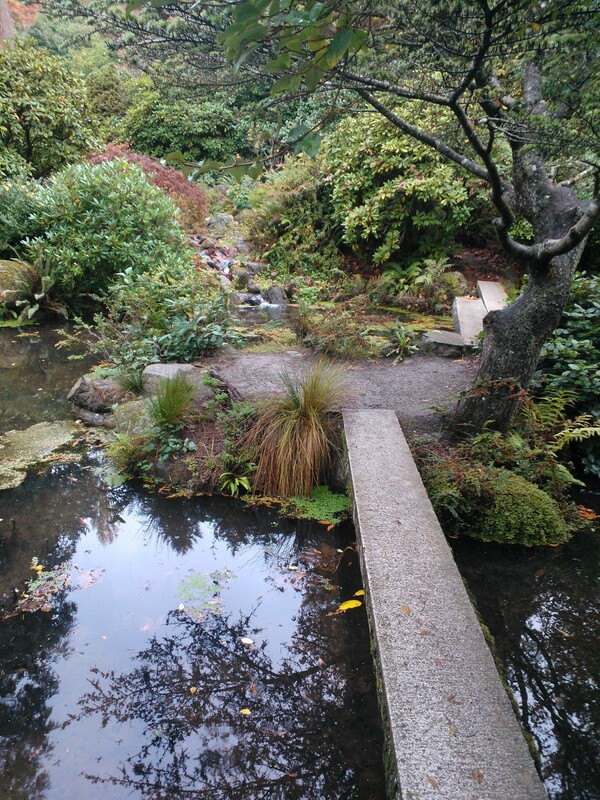 Kubota Gardens may be the largest Japanese garden in North America and offers 22 acres of rolling hills, natural springs, and hiking/ walking trails, and of course, beautiful landscaped gardens. More information is available at http://www.kubotagarden.org/. There are creative ways to beautify city tree base mounds and their small spaces. Here’s a simple yet gorgeous arrangement with two orange tea hucheras on each side of the space. It also features a few mini – ferns as well as ground cover types. The tree mound has a meandering black creek rock dry creek on one side of the tree mound. Large rocks are placed around the mini- garden to give a natural look and feel image. This offers an attractive alternative to the rather unattractive look of most tree base mounds you see around town; another good example maximizing limited space. This one is located on 15th in Capitol Hill, Seattle. There are two water features in this mini garden my brother designed which bring his garden to life — a natural looking wood plug-in mini waterfall and the black pebble dry creek and pond. With the water feature in the background and the black pebble pond in the foreground, he’s created a paradise in his small back yard with three Japanese maples – one purple lace maple to the right, a taller green Japanese maple providing shade to shade plants and flowers below such as hostas and Japanese irises, and a feathery lighter lace maple behind the water feature in the back corner of his space. The garden also uses a wide variety of ground covers, including one flowering mound of pink in the foreground next to the deck along with blue flowering groundcovers, giving rise to natural imagery. This Japanese mini garden works in this small space because all the plants chosen complement each other, and everything is proportionately sized correctly, including white mini lantern on the side. Probably due to their unique and resplendent colors, I would say there are two top Japanese ornamental grasses that rival each other in popularity – the Japanese red blood grass and Japanese yellow forestgrass. Of the two, only one is indispensable to a complete Japanese garden image – the forestgrass. In addition to its bright yellow hue, the Japanese forestgrass displays as a flowing cascading ornament unmatched in the world of grasses. Varieties of yellow hairgrass and sedgegrass are more hardy versions. They can be used to accent a garden or garden area with a simple placement in the foreground of any garden area as pictured above. Japanese gardens seek to bring out the balance of the natural world. A key intent of Japanese gardens today is to replicate the natural world in smaller spaces; re-creating miniaturized versions of serene natural landscapes. In that re-creation, there are a few principles that bring across that image of balance, such as boundaries and regions that reflect the natural world. Boundaries include regions divided by grass areas, or dry gravel areas. These can be divided by pathways, borders, or water. These borders can be rounded or straight edged, but remain consistently one or the other within the same region. These also include water borders, such as waterfalls, dry creek beds, flowing streams, ponds, and lakes. A common number to create balance in the garden is the use of threes- three stones or three clumps of grasses. As a general rule, taller trees and plants are placed in the background, while shorter plants such as ornamental grasses and flowering plants are placed in the foreground. So long as the plants create a natural flowing space, the garden can be minimalist with very little foliage, or it can be lush with carefully placed grasses and flowering plants and shrubs. Both can be accented with lanterns in the foreground, or off to the side. A taller Japanese maple tree is always a good background for either approach, as are tall pogodas.